As my time in Chiang Mai is drawing to a close, major things are afoot at HDN, but more on that later. Much later. That is not to say that decisions related to my work are any less ad hoc than before. Au contraire. It means for example that although it was scheduled for months for me to do a training in Malaysia, my going has now been cancelled. Not only will I now have to pay myself to check out the Petronas Twin Towers, my last day at HDN will be July 15th, next Tuesday. This will leave me exactly two weeks before I depart for the IAC, International AIDS conference, in Mexico, where I’m supposed to be meeting a bunch of bigwigs to intimidate them into using a collaborative web based platform based on Blogger, Flickr and the other usual suspects, which I’ll be setting up for them through Inis. The good thing about this trip is that it allows me to take breaks in both San Francisco, which beyond a doubt will see me visit Los Angeles, and Tokyo, dream of dreams. You see, being an IT freelancer isn’t all bad. Meanwhile, after celebrating my first Thanksgiving ever, last year, I know celebrated my first fourth of July, ever. The American consulate threw a party and through Todd and Felicia, I was invited to attend. I just learned that the US has an obesity rate of around 25% and that recently, for the first time ever, there are more obese people in the world than there are people starving. Well, these demographics were very obvious last Thursday. Yes, you sharp bugger you, that was July third, not fourth. Having attended quite a few Dutch queen’s day celebrations abroad, this July 4th felt a bit like a poor cousin’s happening. Remember this was invite only, passports were checked at the door against a guest list, but still you had to pay to get in. 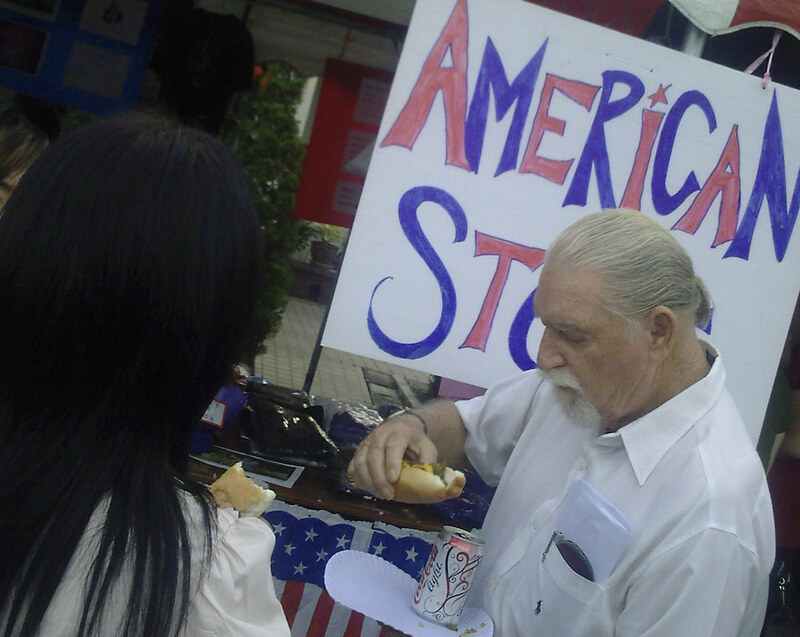 Then, McDonalds, Subway and a few lesser known joints were selling typical American foods, at regular prices! Now, seriously, how’s one supposed to get plastered? On the upside, there was a pie eating contest as well as a dance-a-thon. I think. Back to my upcoming trip. I’ve started Travelhog.net some seven or eight years ago and although, for a while now, it’s been on the back burner, some people still use it to book hostels. Recently, I was offered the opportunity to put up a second hotel booking engine, besides the one I’ve got from Bookhostels.com, also used by the likes of HostelWorld, Lonely Planet and Hostels.com. I regularly get those requests and almost always decline because most of these accommodation search engines only return expensive or very expensive places to stay. So, I was positively surprised when I tried out the booking engine of Hotels Combined. I tried it out for my upcoming trip to Mexico and found that the prices returned were very reasonable, starting at around 15 euros, for real hotels, not hostels. To compare, the booking engine from Bookhostels returned cheaper beds, but only few cheaper rooms. Likewise, for both Tokyo and San Francisco, the other two stops on my upcoming trip, Hotels Combined returned reasonably priced accommodation: 17 euros for a room in San Francisco, 38 euros for Tokyo (Tokyo is very expensive). The search is a bit slow, but that’s, I presume, because the site compares a dozen or so online accommodation search engines before giving you any results. This meant that, for the hotel I was interested in in Mexico, it went for 17 euros per night through one provider and 60 euros through another. The benefit of Hotels Combined, right there. In the end, however, I still booked through Bookhostels.com and ended up paying a bit more than the 17 euros, even. The downside with the cheap option through Hotels Combined was that I had to request availability which could take up to a day. I wanted to book immediately and be sure of getting a room, not having to wait and then, perhaps, having to book again. Mentioning Lonely Planet, whatever happened to Rough Guides? Practically every tourist you now see anywhere carries a Lonely Planet, Rough Guides seem to have gone out of style. Meanwhile, I learned today that it’s illegal to leave your house in Thailand without underpants on. Imagine the risk!